Small to medium sized evergreen with leathery, dark green, ovate leaves about 5cm long and reddish young shoots. Funnel-shaped, primrose yellow flowers, spotted orange inside, in clusters of two or three and opening from buds with contrasting pinkish-red scales. Early flowering from late winter to spring. 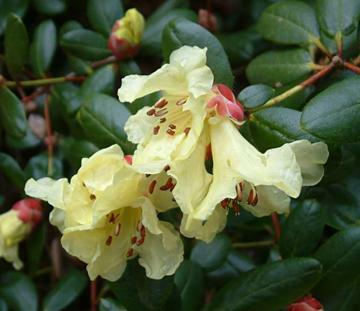 Hybrid of Rododendron moupinense x Rhododendron sulphureum, raised at Caerhays Castle.